Darro Grieco, the Master of the Berkeley Olive Grove, is dedicated to producing the finest olive oil for your enjoyment. We call it “Heritage”, it abounds in polyphenols which are beneficial antioxidants for your well being. It was our privilege to interview him; here he is to tell you of his work and aspirations. Soak the persimmons in 3 cups of filtered water for one hour. Drain and save the persimmon water. Place the drained persimmons, coconut meat, turmeric, lemon juice, salt, maple syrup, 3 Tbsp. of the persimmon water, and orange extract into a Vitamix. Blend until creamy smooth. Add the melted coconut butter to the Vitamix and blend it in. Add the coconut oil and blend it in using a tamper. Remove ½ cup from the Vitamix and set it aside for future use. Take the remaining mixture and place it into an airtight container in the refrigerator overnight. (Natural News) If you were buying organic food ten years ago, more than one acquaintance probably rolled their eyes at you and said you were being taken advantage of by a savvy marketing ploy. Over time, however, attitudes have started to shift as more people become aware of the impact that fruit and vegetables grown with pesticides can have on your health as well as the environment. Now, many of those same skeptics who once gave you a hard time about your choices are stocking their own pantries with organic food. According to a Nielsen survey, the vast majority of American households – 82.3 percent, to be exact – had organic items in their refrigerators and pantries in 2016. This marks a 3.4 percent rise over 2015’s figures. They reached their conclusions after studying 100,000 households in every state except Hawaii and Alaska. The biggest jump was seen in North Dakota, where 14.2 percent more households are buying organic than a year ago, while Rhode Island noted a rise of 12.3 percent. Other states to note big jumps included Wyoming, which is up 10.8 percent, and South Dakota, which noted a 10 percent rise. 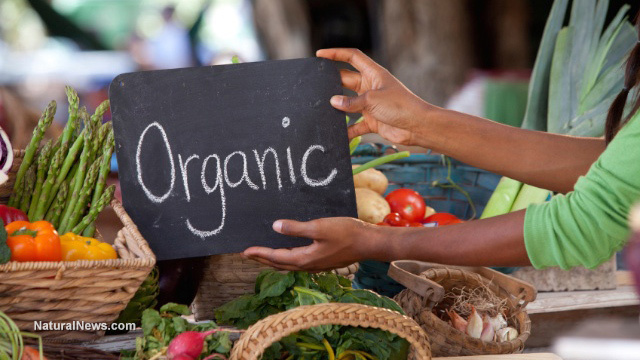 While sales figures for the American organic market from 2016 are not yet available, the total amount of organic food sales noted in 2015 was $43.3 billion, which was 11 percent higher than 2014, according to a press release from the Organic Trade Association. This far outperformed the overall food market during the year, which only grew by 3 percent. The fresh beverage subcategory was the fastest growing, noting a 33.5 percent rise, while dairy noted an increase of more than 10 percent. (Mercola) Environmental temperature has more than one influence on how your body functions. For example, did you know that exposure to extreme temperatures can be a catalyst to improve your health? As you may have read in previous articles, mitochondria are the energy generators in your cells. When they don’t work properly, your body’s ability to produce energy is impaired. This may affect not only your metabolism but also your immune system and how diseases are triggered and grow. The key to getting older mitochondria out and creating new ones is called mitochondrial biogenesis. This process is triggered through exposure to extreme temperatures, exercise and intermittent fasting, for example. Your sleep is also dependent on appropriate temperature regulation. As you sleep your body’s natural internal temperature drops to the lowest level, usually about four hours after falling asleep. You may take advantage of this function, improve your quality of sleep and your ability to fall asleep, by making a few adjustments in the evening. (Buffalo Field Campaign) It has been an intensely difficult winter for the buffalo and those of us who love them. At least 1,300 wild buffalo souls were lost, taken by the rifle and the trap to appease the intolerance of the vocal minority that make up Montana’s cattle industry. The lives of all these buffalo were wasted because those who continue to wage war on the west insist that the land is theirs to do with with as they please, other lives be damned. Thankfully, for now, the killing is over. The trap is closed and the hunters are gone. Spring is here and the snow is melting. Migratory birds such as pelicans, Sandhill cranes, and mountain blue birds have returned early. Grizzly bears are waking up and the grass is turning green. The timing for the buffalo and other grazers could not be better. They suffered a long, hard winter — just the snow conditions alone were enough to kill many — and their haggard bodies are hungry for nutritious grasses. Adult females, bellies huge with calves, are bringing their families to where they will find replenishment and rest. Buffalo have all but vanished from the Gardiner Basin. Just a few small groups remain, poised to join the other survivors who are heading south to their calving grounds around Blacktail Plateau. Some buffalo will continue further, and come from other places, heading west into the Hebgen Basin and on to Horse Butte and surrounding lands here. 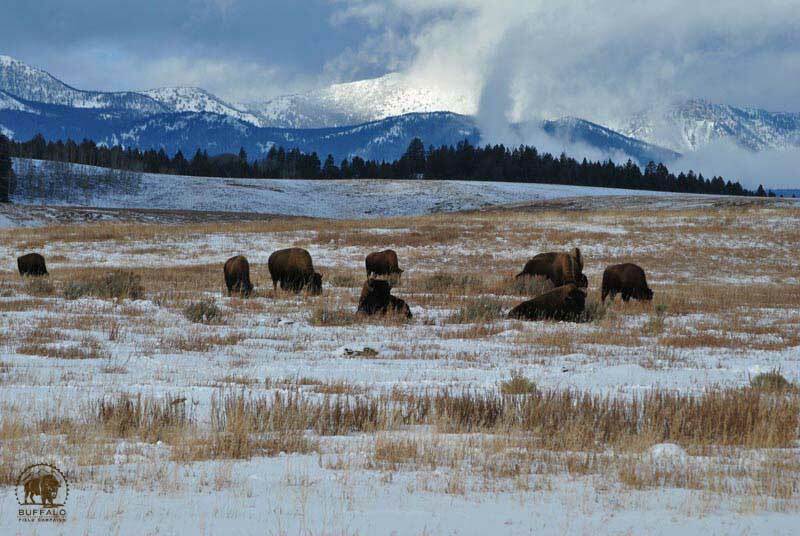 Near West Yellowstone, a buffalo nation is coming! And thanks to last year’s enormous victory of gaining year-round habitat in a portion of this basin, our volunteers and local residents are able to celebrate this sacred arrival without the bitter edge that always came with the fear of hazing. This time, the buffalo can roam to Horse Butte and lands north without being threatened by horsemen, law enforcement officers, or helicopters. They can stand on the land they need to, have their babies in peace, and grow strong without being brutally chased by livestock agents for miles on tiny legs. The buffalo families coming to Horse Butte and other lands north of the Madison River now get to choose where they will roam and for how long. Despite these great victories, threats remain.